My workshop at Long Wittenham is on the ancient Thames flood plain near the equally ancient river crossing at Clifton Hamden. The surrounding land has an open feel with long views. Away to the west the horizon is dominated by the cooling towers of Didcot power station, an industrial blot to some people but actually it has an architectural elegance I rather like. To the south east the Wittenham Clumps appear to pop up in the landscape and provide great views over the Vale of the White Horse, the name sometimes given to this area bordered by the Cotswolds to the north and west, the Chilterns to the east and the White Horse Hills to the south. Yesterday, while I was busy putting together the low, curved casing that hides the motor and batteries in the Thames motor canoe I am re-building, Megan arrived with Vinnie, her characterful little dog. The winter sun was out so the best thing to do was a good walk up to the Earth Trust arboretum. A walk and a talk then back for coffee. Back inside the workshop, I am fitting the beaded mahogany paneling that line the two ends of the casing. I have finished the central louvered panels that will provide good air flow through the motor compartment. These panels have been complicated to make as I always like curves, so the casing has a top camber and its aft edge is also curved in plan view – meaning the louvers had to match! Fortunately, the person who owns this boat understands subtle detail, we have a long history of great projects together and I know everything I put into this elegant launch is worth the effort. Next week’s challenge is the curved Mahogany lids that make up the top of the casing. I have already started to hollow out the widest middle panel producing a tumble of curly red Mahogany shavings that have spread around the workshop floor. There is plenty more work with the planes as the week goes by. ← Boats and me. 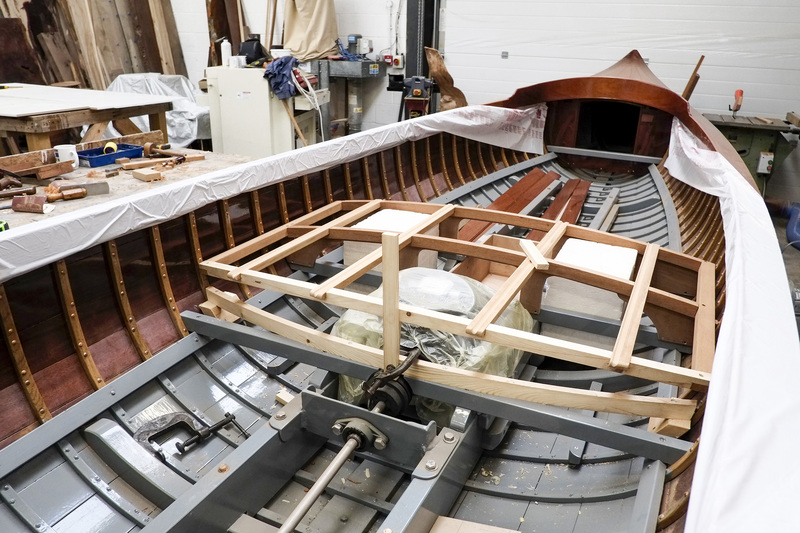 I have been working on Thames skiffs, punts, and canoes for over 35 years!